“I bet I am the only Metropolitan Club member with a building named after her,” Adelma notes with a twinkle in her eye and an appropriate dash of pride in her voice. The Adelma LoPrest Building is located at 551/555 Minna Street and is the home of the San Francisco Medical Center Outpatient Improvement Programs, Inc. (SFMCOIP) to provide comprehensive quality health care and dental services to South of Market residents. Adelma’s philanthropic support of this state of the art medical facility reveals a lot about her, but is only one of several examples of how she has chosen the “road less traveled” throughout her life. And a long life it has been. “On August 30, I will enter my 101st year,” explains Adelma. Called “Del” by her family, she was born Lucy Adelma Taylor in Kenilworth, Utah, a town that began as a coal mining camp in 1908, four years after coal was discovered in the area. Her parents had traveled from England, across Canada, to Kenilworth which was originally named by British miners who thought the nearby mountain peaks looked like the spires of Kenilworth Castle. The 1910 census lists the population of Kenilworth at 500; the 2010 census lists 180 residents. She was the fourth child of five, with two older brothers, an older sister and a younger brother. The family moved to Hiawatha, Utah, in time for her to begin grade school, and then eventually to Salt Lake City where she completed high school by age 15. Her older siblings had gone east for college – a brother to Duke University and her sister to Randolph-Macon, a women’s college in Virginia. 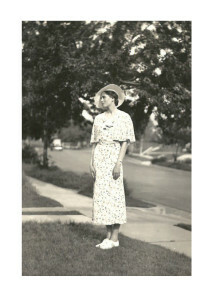 Adelma, however, graduated from the University of Utah, citing the Great Depression as the reason for staying closer to home, where she studied psychology and sociology, including a semester in a Master’s program. Owning and running a company made long trips difficult, but Nino and Adelma did travel to many locations, including Sicily where Nino’s family was from. 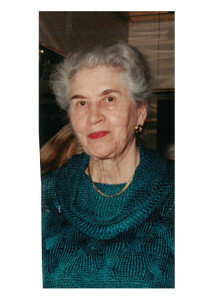 After Adelma became a member of the Woman’s Athletic Club (now Metropolitan Club) in 1960, they dined there frequently, either alone or with friends. They also took classes together at the old UC Extension on Laguna Street. Adelma remembers that she took Spanish (“I had studied a lot of French in school,”) and a water treatment class. Nino and Adelma were opera fans. They had season tickets to the San Francisco Opera and on various trips were able to attend opera performances in Rome, Milan, Paris, London, New York, Chicago and even once in Oklahoma. In 1955 they moved to an apartment on Broadway, across from the Schools of the Sacred Heart, where Adelma still lives. Nino passed away in 1985. Adelma notes that she did a tremendous amount of walking over the years and always ate well, attributing her longevity to the exercise and good food. Adelma treasures her cross country trips (“My sister and I drove together to the 1933 Chicago World’s Fair”) during which she was able to visit every state. “I love road trips and traveling by train and car.” She continues to enjoy her friends, talking weekly by phone. She plays bridge every Sunday afternoon with a group of long-time friends and she still enjoys going out for lunch or dinner, but only when there is someone to offer her “door-to-door” service, a perk she has earned in her life well-lived.